CHARLES DARWIN Autograph Presentation Signature. British naturalist, best known for his theory of evolution. 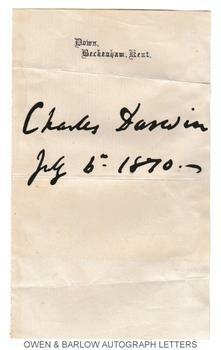 Autograph presentation signature "Charles Darwin" together with the date "July 5th 1870" on his Down, Beckenham, Kent headed notepaper. 12mo. Approx 5.5 x 3.75 inches (14 x 9.5 cms). 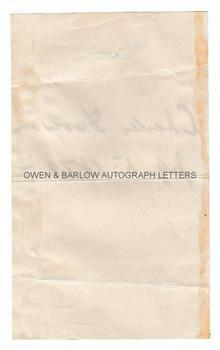 Old folds and creases, slight browning and with mounting traces to verso. In very good condition. A nice example of Darwin's signature. This is not a signature cut from a letter or document but was specifically inscribed on a blank sheet of Darwin's notepaper for the daughter of James Copland of the Royal Society. It is signed in his full name in a large, bold hand that occupies the whole width of the sheet. It is the largest Charles Darwin signature we have handled. At the date of this signature, Charles Darwin was working on his book 'The Descent of Man', which was published in the following year. James Copland MD, FRS was a Scottish physician and medical writer who had an amateur interest in geology and, like Darwin, was a Fellow of the Royal Society. He died in 1870, the same year as this signature. Provenance: From the 19th century album compiled by the family of Dr James Copland FRS (1791-1870).